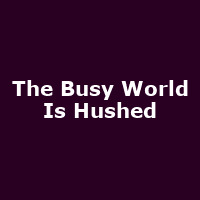 The European premiere of a new play by the acclaimed American playwright Keith Bunin in his UK debut, The Busy World is Hushed. Hannah, a widowed Minister and Bible scholar, finds her faith at odds with that of her long estranged gay son, Thomas. She has recently hired an inquisitive young writer, Brandt, to assist with her book about a newly discovered manuscript that appears to be a lost gospel, one that may predate those in the Bible itself. As she notices the chemistry brewing between Brandt and her son, she decides to risk all on an unconventional opportunity for reconciliation that has unexpected consequences for all three of them.